I don't have time to write anything profound. Please excuse me! Quick outfit post I wore shopping yesterday. Coat: Danier, Bibles for Missions Thrift, $3. Top: Value Village, $4. Skirt: Zara, $30. Leggings: Joe Fresh, $10. Shoes: Doc Martens, gifted. Purse: Vintage Show, $10. Photos taken by Lisa Kidd. This is the first thing I found. I'm a sucker for all things sequin and have a growing collection. One thing I was missing was something in white sequins. When I saw this baby, I knew it was mine. It's from the 60s yet very clean and bright. Each sequin is still in place and I love the puffy shoulders. 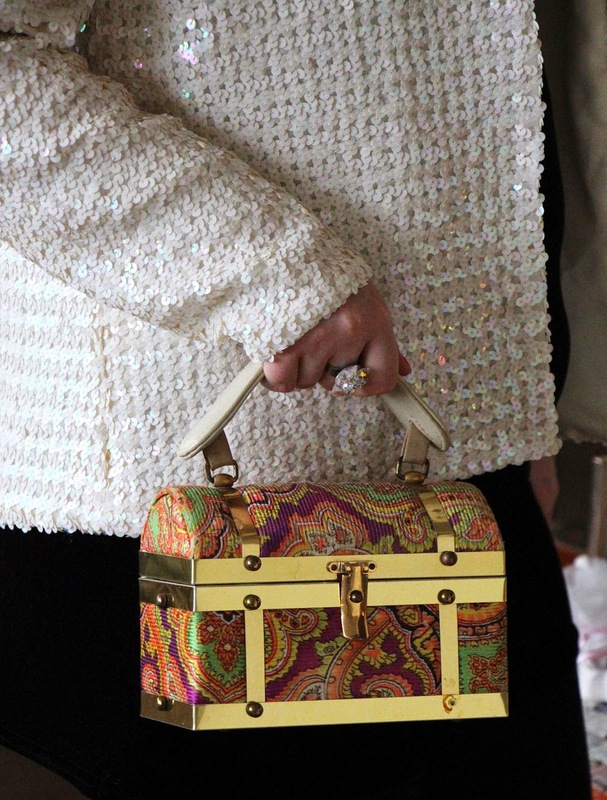 I've been seeing a lot of boxy bags and clutches on the runway and street style for the past couple of years. I had been hesitant to buy one for two reasons. One, I hadn't really seen very many in stores and if I did, they were quite expensive. Two, they aren't very practical. I saw many at the show this year and I just couldn't stop thinking about them. I found this cute trunk one and fell in love. I didn't buy it right away though. I finished my loop around the show and since I couldn't get it out of my head, I decided it was meant to be. I can't wait to wear it out! There were a lot more jewellery booths this year. One in particular had rows of vintage gold chains. I immediately knew I wanted one since I had been wanting to make use of my many brooches who don't see daylight enough. I'm planning on attaching a brooch to the middle to make it more unique. 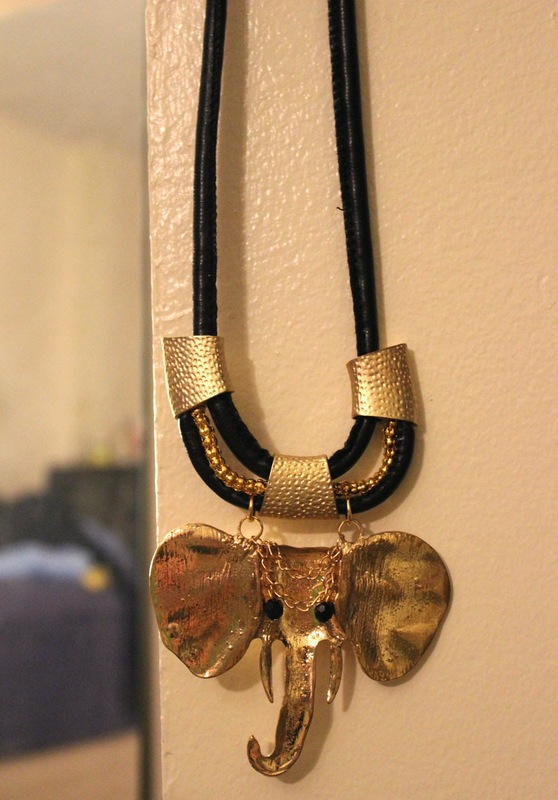 And yes, I realize I could find one of these at F21 for $10 but it will never match the quality of these vintage ones. 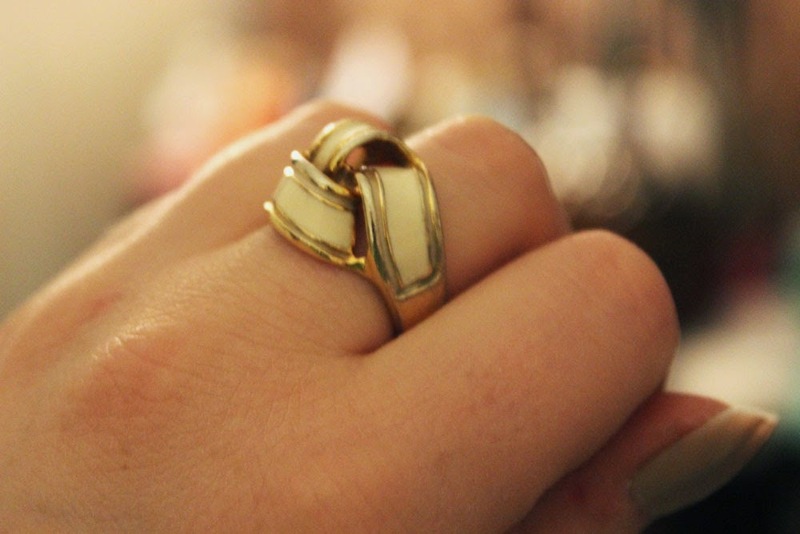 It's tradition that I buy a ring at the vintage show. I recently developed an allergy to metal on my hands so I can only wear silver or gold and the vintage show is by far the best place to find real silver rings that have bobbles or jewels on them. I found this one at a booth that specialized in turning broken vintage jewellery into new creations. 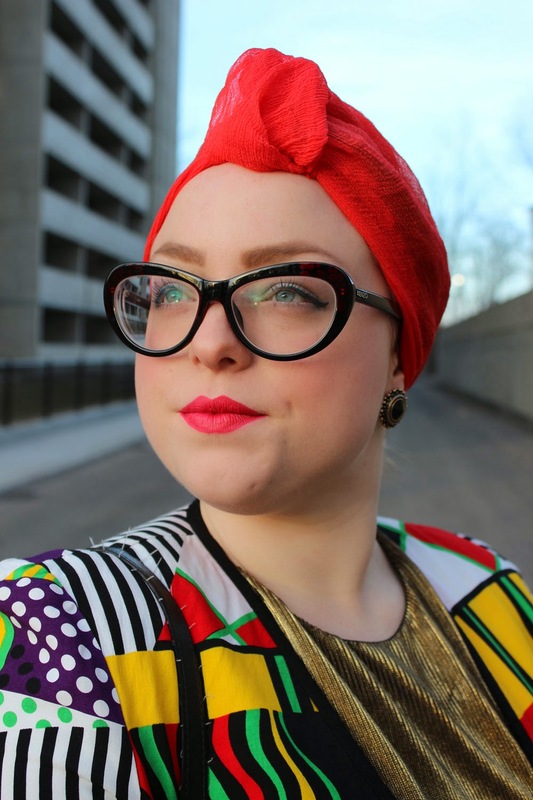 Ottawa Vintage Clothing Show: Spring Edition! I'm a freak for anything vintage. Vintage items are different, durable, and charming. I'd way rather shop in a thrift store or vintage store than a mall any day. 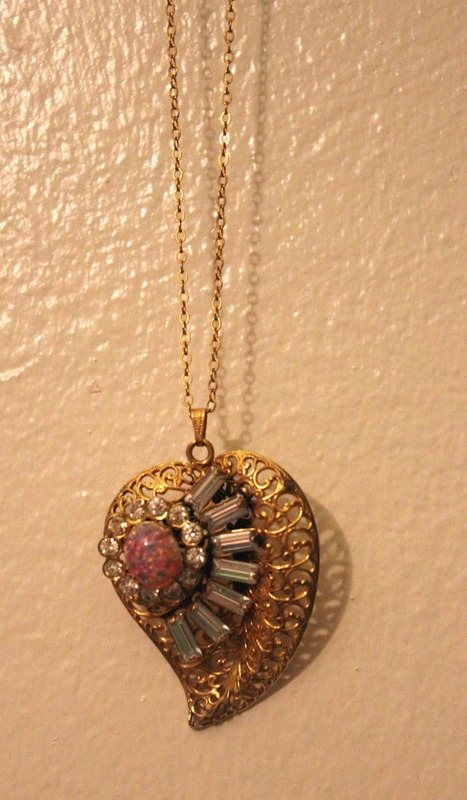 My eyes never get bored when vintage hunting and I feel like I'm searching for buried treasure, quite literally. 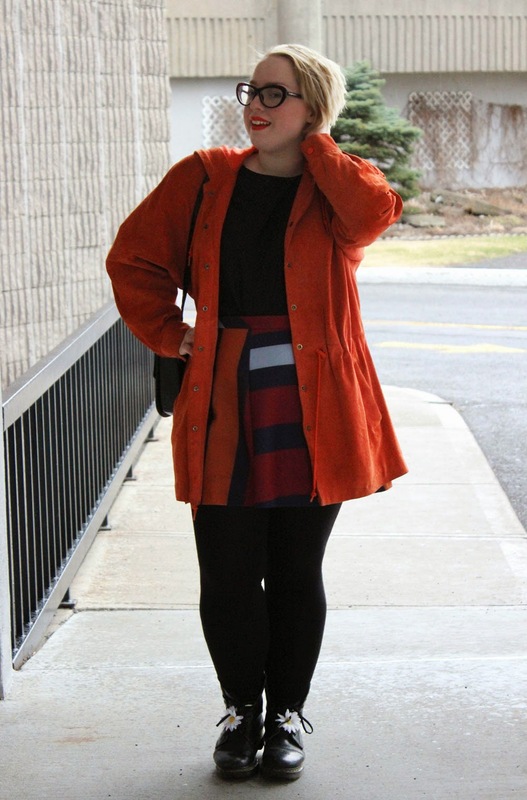 This past Sunday was the Ottawa Vintage Clothing Show and my fourth (or fifth?) time at the semi-annual show. While I usually go with friends and end up on my own lost in the vintage abyss, this time I went to the show alone. I arrived with two hours to shop but took my time sifting through each booth, carefully looking out for gems. I can scan a rack pretty quickly and decide if there's anything special worth looking into. What I wore: blazer: borrowed from sister Lisa, pants: value village, $6. top: value village, $4. It was lovely and inspiring meeting Joa. How fabulous is she? Dressed to the nines from head to toe and the attitude to match! She is a creative consultant in Toronto but will be moving to Ottawa shortly (and very excited about it!). I was blown away by her outfit. Happy she agreed to let me take her photo. I was drawn to Cherry's vintage army style and bright red locks. Lovely meeting you! Last Sunday I spent my afternoon at the Antique Show with my mom. We had a blast sifting through all of the antiques. I always love seeing the furniture, oddities, and jewellery. 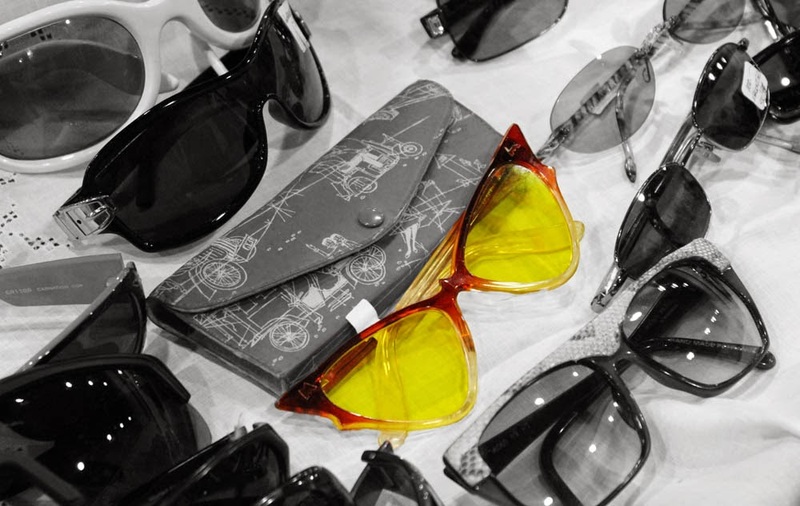 You just never know what you'll find at the show and you're guaranteed a one-of-a-kind piece. I bought two necklaces and one ring, see below. I'm so relieved and excited that Spring is finally here! I'm happy to report that I haven't worn my coat two days this week. Feeling the sun on my face truly does lift my mood and makes me feel warm and fuzzy. I'm really looking forward to Summer, you? REMINDER: ottawa vintage clothing show this weekend! 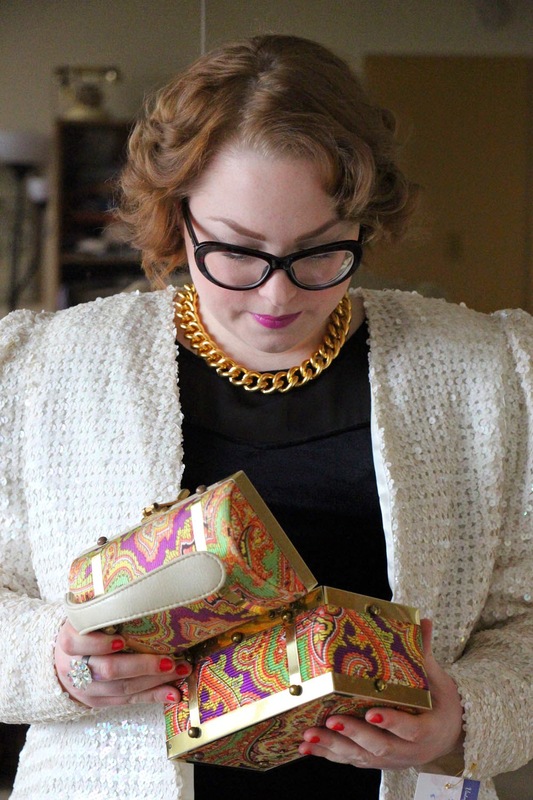 This weekend is the Ottawa Vintage Clothing Show. It's quite possibly my favourite day of the year. If you'e a vintage lover or collector, you absolutely have to drop by this Sunday from 10-5 pm at the Convention Centre. Tickets are $10 and can purchase them at the door. See you there? When I first started my blog, I had a few outfits in mind that I knew I wanted to show you and this blazer was definitely on that list. What's funny is this is literally the first time many of you see this blazer. I've had it for years and it's safe to say it's my favourite. It's been named by friends as my hussel blazer because it reminds them of music artist M.I.A. and her song Hussel. It also fits me at virtually any size. The garment itself is a size 4 but it fits me anywhere between an 8 and 16. Sorry to be corny but it literally resembles the sisterhood of the traveling pants. It just magically always fits. This is part of the reason I invest in so many blazers. Not only are they classic, they're flexible. 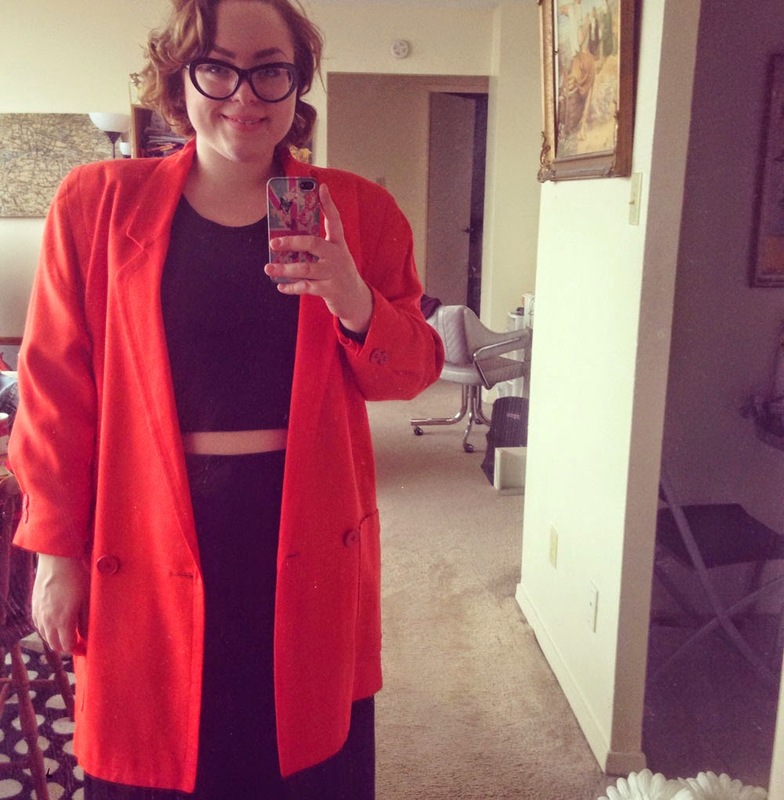 Do you have a garment that fits you at every size? I tend to wear it on special occasions so when I was invited to attend a Carnivale-themed fundraising event in support of mental health, I knew exactly what to wear. The event featured a magician, slam poet, and improv group. It was put on by the PR students at Algonquin College so I wanted to show my support of the program that changed my life and also a cause that touches my heart. blazer: alfred sung, value village, $4. top: value village, $6. leggings: american apparel, $40. boots: forever 21, $22. headscarf: value village, $1. bracelets: value village, $2, aldo, $3. bag: valentina, winners, $26. earrings: aldo, borrowed from Lisa. Photos taken by Lisa Kidd.